"I've made this recipe for special dinners all through my 46 married years, and it's always been a hit. My sister worked for a farm wife during the late '30s and early '40s, and she got this recipe from her. It's especially delicious when the apples are freshly picked, and it adds wonderful color to any table!" In a saucepan, combine sugar and flour. Stir in water; bring to a boil. Cook and boil until mixture thickens. Remove from the heat; stir in butter and vanilla. Cool to room temperature. 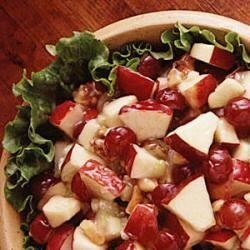 In a large bowl, combine apples, grapes, celery and walnuts. Add the dressing and toss gently. Refrigerate until serving. I was skeptical about including the celery, and although it actually worked quite well, I would probably omit it next time (just personal preference). Good stuff. Thanks, Kathryn! I have made this recipe with only a slight decrease in the amount of sugar, several times. It is always delicious and popular. I made it. I didn't have celery. So, I added pineapples. It gave it a nice sweet kick! Excellent fruit salad. I have added granny smith apples for more color.